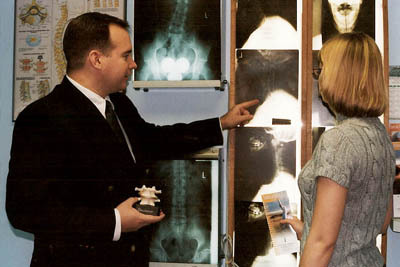 A-Ward Straight Chiropractic in Merrimack, New Hampshire, welcomes you to the Chiropractic Lifestyle. Combined with other healthy habits, Chiropractic Care is part of the wellness approach to life. If you are new to Chiropractic, we will work to assist you in pain or symptom management, improved function and spinal health, and non-symptomatic or preventative care measures. Call (603) 429-3773 today for an appointment with Dr. Richard Ward! A-Ward Straight Chiropractic was designed to be able to spend ample time with new patients, getting to know your healthcare issues, examining you, and determining treatment. Once you are a patient here, you always have access to the doctor and staff. We will always treat you in a kind, friendly manner, will take care of any and all insurance billing and questions, and will write reports and fill out paperwork in a timely manner. We strive to do the best for patients that we can. Massage Therapy services are available at our clinic to complement your chiropractic care. A Doctor of Chiropractic is a highly trained health care provider who utilizes specific scientific techniques and procedures to detect, analyze, and correct the vertebral subluxation -- or, mis-alignment of the spine. Once diagnosis is made, the chiropractor performs specific adjustments of the spine to reduce the subluxation and return the vertebrae to a more normal position. This process removes interference to the normal functioning of the spinal nerves allowing the body to return to a balanced state of physiological functioning. Chiropractic philosophy recognizes the power of the body to heal itself. The main purpose of the chiropractic physician is to facilitate this process. Chiropractors are specifically trained to reduce subluxation and the resulting nerve interference so that your body can heal itself, naturally. Regular chiropractic care can help you maintain a healthy lifestyle. Remember: Chiropractic doesn't cure anything -- you do!